This one-year action research project (January 2018 – January 2019) aimed at developing a better understanding of the challenges and opportunities of establishing residents’ housing co-operatives through partnerships with housing corporations in Amsterdam. The research followed the process of two ongoing cases of such partnerships and brought in European examples that could shed light on the challenges and possible solutions for establishing and managing resident-led co-operative housing. The main aim was to help Dutch professionals and self-organised tenants’ groups to co-determine suitable governance arrangements for this purpose. The research was led by Prof.dr.ir. Vincent Gruis and Dr Darinka Czischke and included the participation of post-doctoral researcher Carla Huisman and research assistant Stephanie Zeulevoet. The project was funded by the NWO Smart Urban Regions of the Future (SURF) Pop Up grant. Please scroll down to check the developments of the project throughout 2018. The event was held by the Co-Lab Research group and brought together professionals, residents and researchers from the Netherlands, France, Austria, Sweden, Belgium, the UK and other European countries to discuss findings of the research and to learn from similar experiences abroad. The seminar, attended by about sixty participants, included presentations about collaborative housing in Vienna, Brittany (France), Stockholm and Antwerp, parallel thematic workshops and panel discussions. During the day, participants discussed how residents can best self-organise to govern and manage their housing; how housing professionals can provide efficient and effective support to residents’ groups in line with their organisational goals; and what Dutch collaborative housing can learn from international examples. The next morning was dedicated to a fieldtrip to two collaborative housing projects in Amsterdam: Startblok Riekerhaven (one of the case studies of this projects) and Nieuwland (a project led by Carla Huisman). In general, the event received a very positive feedback, described as ‘useful’, ‘inspiring’ and with an interesting ‘international and background mix of people’. To access all the presentations, please click here. 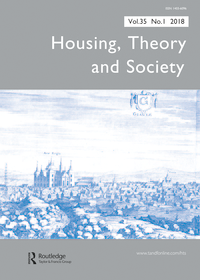 The article by Darinka Czischke and Carla Huisman entitled ‘Integration through Collaborative Housing? Dutch Starters and Refugees Forming Self-Managing Communities in Amsterdam’ has been accepted to be published in Urban Planning, an international peer-reviewed open access journal. This study presents some preliminary findings of one the case studies of the SWSO project, namely Startblok Riekerhaven. To read the full article, please click on the link below. Darinka Czischke and Carla Huisman presented some preliminary findings of the research at the Collaborative Housing Workshop, at the European Network for Housing Research (ENHR) 2018 Conference in Uppsala, Sweden. Darinka Czischke and Carla Huisman gave two workshops at the Platform 31 day conference on Dutch housing cooperatives in The Hague. The sessions, prepared by Stephanie Zeulevoet as well, were well attended and introduced the participants to Austrian, French and Swedish forms of collaborative housing. April 9 2018: Pop Up projects VerDuS SURF meet each other!